Her kind, being small in nature, reaches up no taller than the chest of an average female human adult. Mia, not exactly the tallest among the faries, reaches barely above the waist of most humans. Yet she carries herself with a grand stature that would equal any giant, lending this elfish girl a hint of authority that one with such frail leflet wings has no right to have. Her skin is the color of smooth ripe olives dipped in the thickest sweetest honey which offsets her whole manner of dress, which in the norm are the thin whisped tangles of the skeleton of forest leaves. She was never actually born, but rather, gathered from the spirits of the forests and the hopes and wishes of the creatues that dwelt there. For an extensive period of what she considers to be her "childhood", a time during which she had not yet learned to think and act for herself, she spent her time serving the whims of the forests and its various creatures. Then one day, a magikal plague swept across the forests, killing most of its inhabitants. However, it had been their dreams that had been the substanance of her bonds. But with most of them gone, she slowly came to the awarness of the "self", learning through confounding and painful experiences the full implications of freedom. 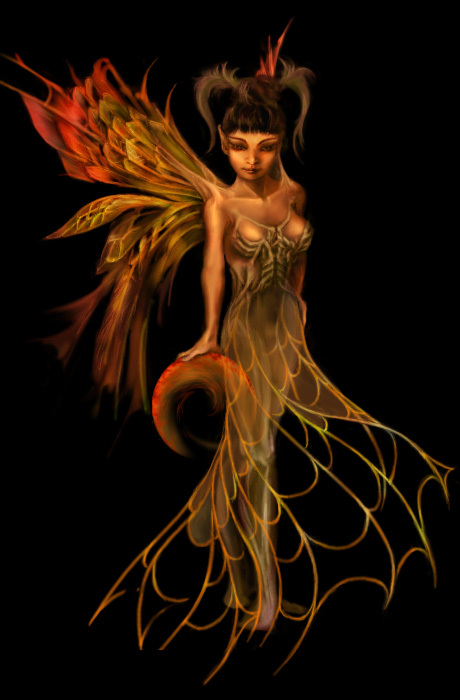 Eventually, she did get past that akward bumbling stage to become a regal and if not somewhat heartless member of the now liberated faerie relm. Later, she would come to speculate that her character as well as appearance has not always been as it is today--that the plague, while killing many, merely transformed her. For now, she shall content herself with wandering the lands and watch in amusement as seemingly random chaos sprout from her unseen meddlings.